Tomatoes are maturing like crazy – all shapes and colors. Let us know if you are interested in buying any for canning. Enjoy! 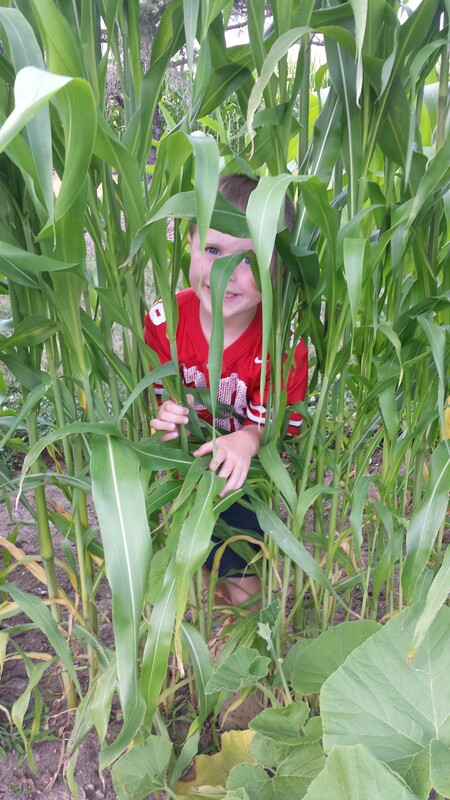 As many of us prepare for school to begin, we are preparing for the growing season to come to an end before we know it. Mother Nature keeps us on our toes, and we must be prepared for what will occur. While some of the produce is hitting their peak. Others are on the decline, and we are starting to see “gaps” in the field as we clean-up and feed garden scraps to the chickens. You also may be wondering, when is our last box? We are anticipating that the last box will be the last week of September. Which will be slightly longer then what your contract stated, simply because of the growing season, and how the crops worked out. We will keep you posted as we proceed through September. We are busy with garden clean-up pulling up old vegetables that are no longer producing and feeding them to the chickens. 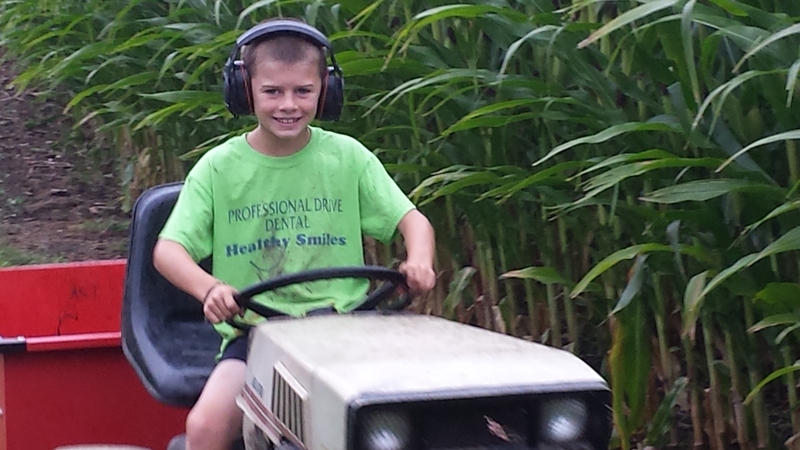 Part of the garden clean-up includes driving the lawn tractor. It makes this task a lot easier! This list is prepared before we harvest your share. Some guesswork is involved! We do our best to predict which crops will be ready to harvest, but sometimes crops are on the list that are not in the share. Sometimes crops will be in the share even though they’re not on the list. 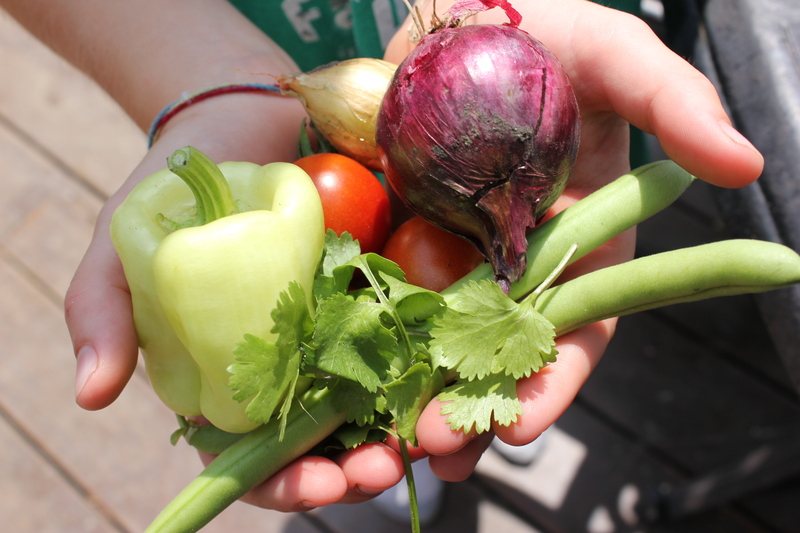 Remember food safety in your kitchen when preparing, always wash your hands before working with your produce and always wash your produce before eating. Sweet Corn – Yeah for sweet corn! 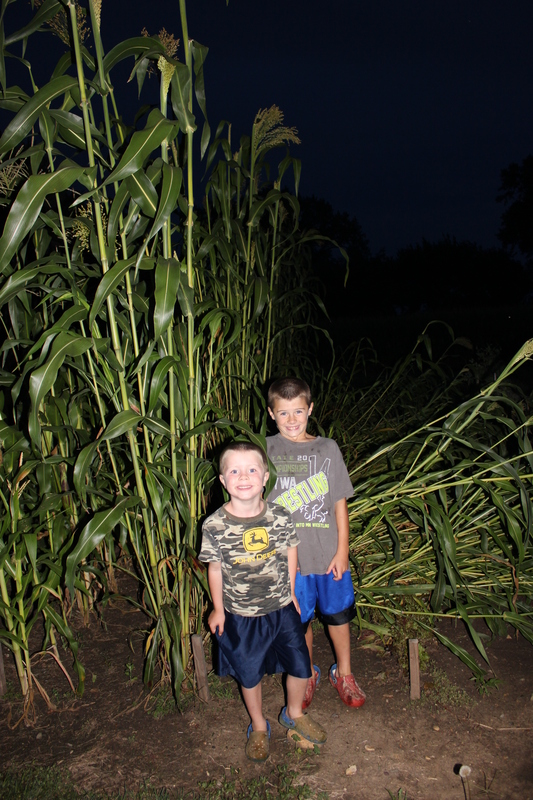 Thank you to FarGaze Farms, our neighbors, for providing the sweet corn for your boxes this week. We hope you all enjoy it. We appreciate this partnership! Salad Mix – A mixture of Black Seeded Simpson, Red Oak Leaf, beet greens and spinach. Here are a few salad ideas. I planted a new crop of lettuce about 5 weeks ago and very little grew because we had such a dry July. After the rain last week, I planted another round and four days later the seeds have germinated and are peeking out of the ground. I am hoping for a new crop of the lettuces in the near future. Beets – The whole plant is edible. Green Beans – We are at the end of this crop and should have a small crop towards the end of the season. 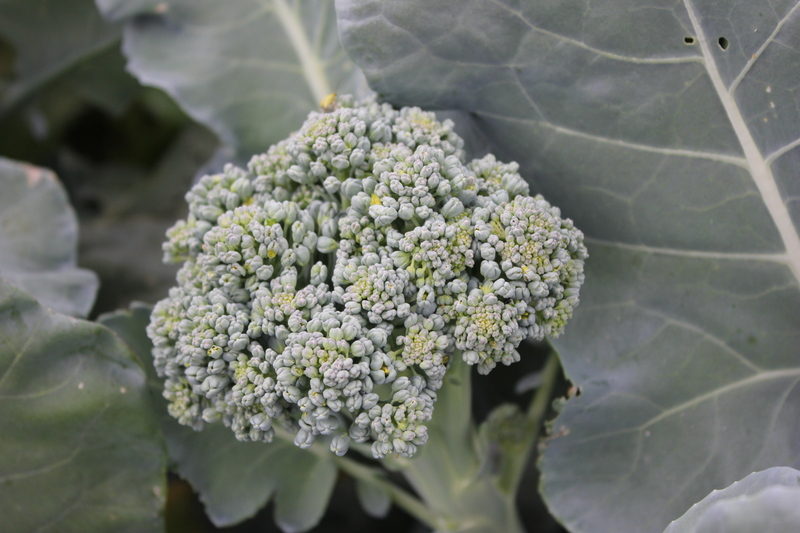 Broccoli – Great to enjoy in your salads or cooked with some cheese sprinkled over it. Cucumbers – Nearing the end of this season as well. Peppers – Jalepeno peppers – see how peppers are grown in America. Tomatoes – Baby Boomer cherry tomatoes, Big mamma, Sunny Boy (yellow), Honey Delight (small yellow) and Fourth of July (medium red) – Learn more about tomatoes are grown across the U.S. on America’s Heartland. The Purple Majesty potatoes need to be dug during the daylight. They blend right in with chunks of soil. Potatoes – Red Pontiac – the link is to more potato basics and recipe ideas. Purple Majesty potatoes – fun as French fries or mashed potatoes. Butternut Squash – Choice of squash tonight. For those of you that chose this squash, it is one of my favorites. Here are a few recipes from Martha Stewart. Spaghetti Squash – Enjoy this as spaghetti. Here are different ways to cook it: by boiling or by roasting. Fresh Arrangement – Zinnia or Sunflowers – Here are a few tips to try to keep your fresh-cut flowers fresh longer. I have tried the bleach trick, and it has worked for me. 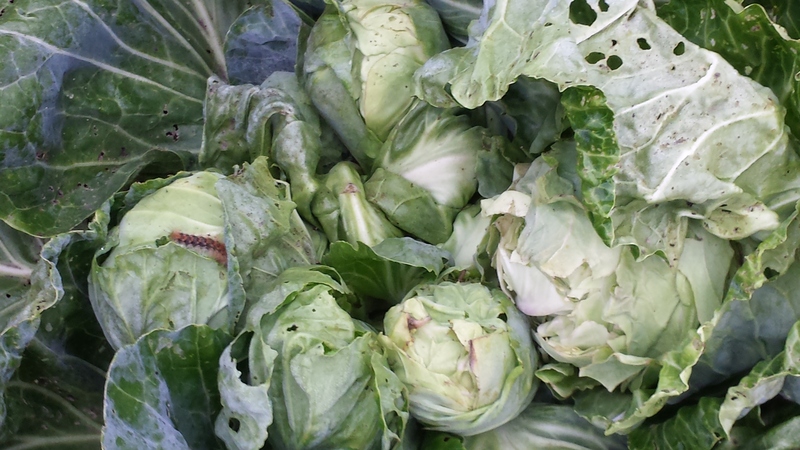 We found cabbage loopers this weekend. Check out how small this one is compared to the thumb. 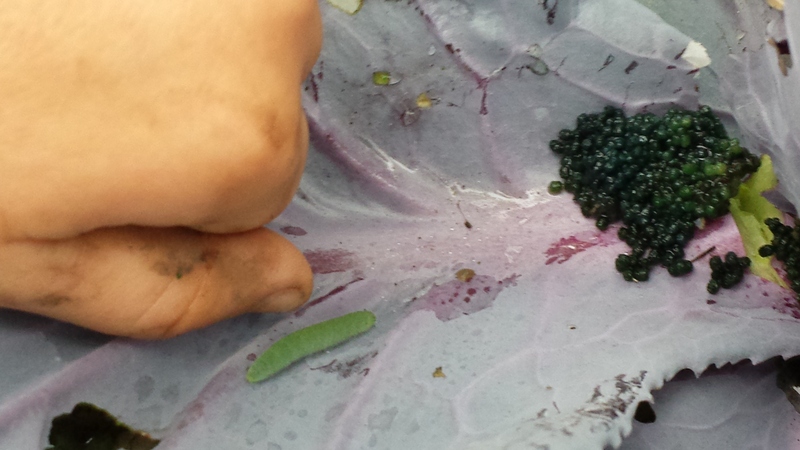 We found a larger cabbage looper. 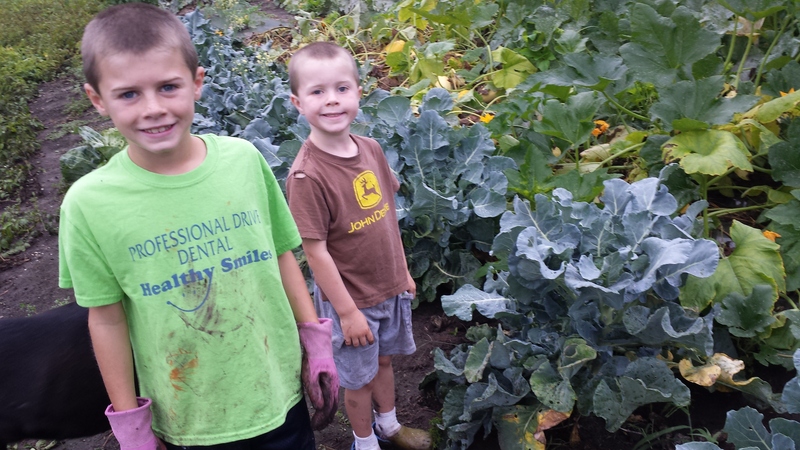 This cabbage is being eaten by the cabbage looper but the boys want to see how many cabbage heads this one forms during the growing season. 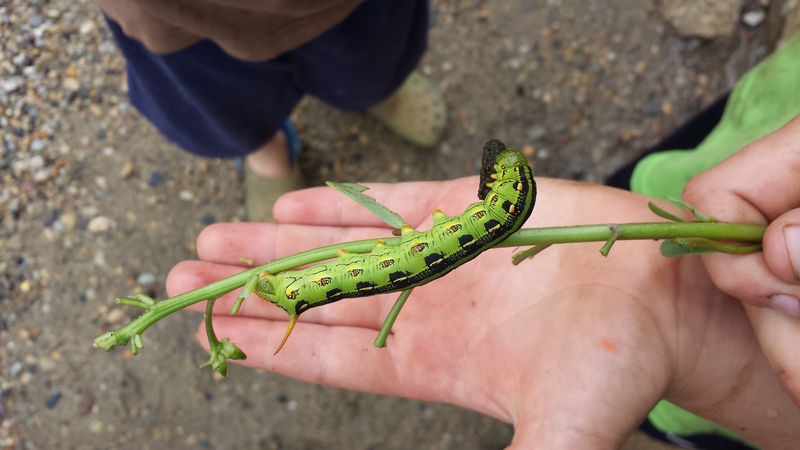 Insects, insects every where including this green tomato worm. The Red Pontiac potatoes were huge. These three were from the same plant. I thought you would like to know what I do with all of the produce. See the links below the recipes and photo how to enjoy your produce throughout the year. Lettuce and Spinach – I enjoy a variety of salads. Give Lazy Tacos a try – super easy and delicious. Green Beans – I freeze or can my green beans. Sweet Corn – I keep freezing sweet corn simple. I don’t have time for a lot of preparation so keeping it simple is my style. Here is Martha Stewarts tips on preserving corn. Onions – I have had the best luck chopping and freezing onions to be used in recipes throughout the year. Less mess and more time efficient. Butternut Squash – I cook and freeze the squash to be used in smaller portions and perfect substitute for a recipe that calls for canned pumpkin. Give these Squash/Pumpkin Donut Drops a try – fun for a long weekend. Potatoes – I enjoy making into Lefse and Potato Bread. 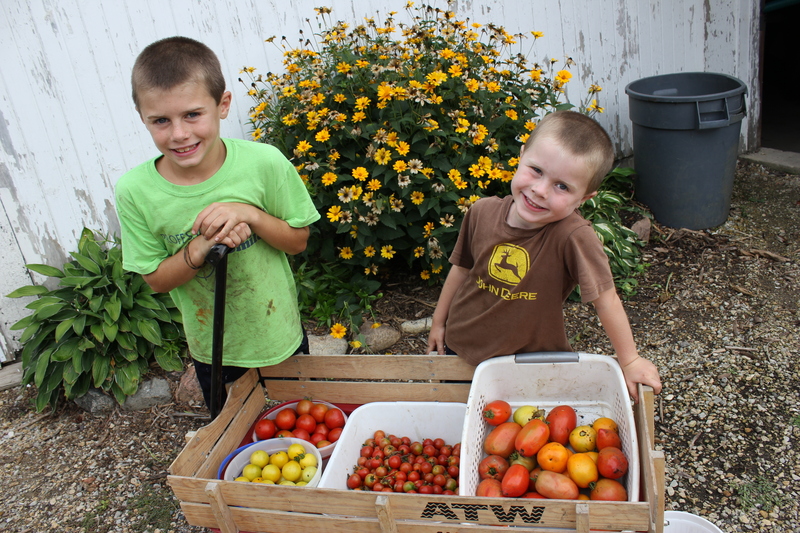 Tomatoes – We plan to can some tomato juice and salsa this fall. We have started the potato harvest and some of them are huge. 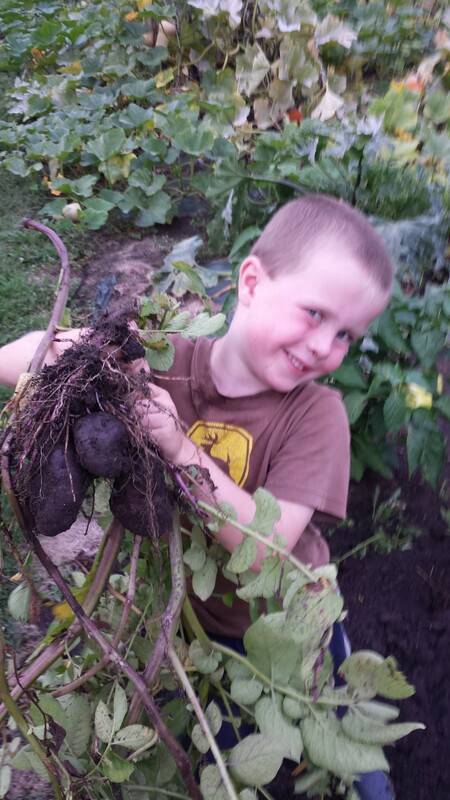 Harvesting potatoes is like a treasure hunt in the soil. We were blessed earlier this week with moisture. The storms came heavy and fast, and surrounding communities received several more inches and storm damage. We drove through some of the heavier parts of the storm on Sunday and were close to stopping because it was difficult to drive in. We were fortunate to receive 2 1/2 inches of rain on Sunday. It did come down quickly and cause some crop damage but minimal damage compared to what could have been. We were also fortunate to receive 4/10th of an inch on Monday. The moisture was needed! The storms have been very sporadic and many farmers throughout Minnesota and our nation are still in need of moisture. On another note, the Minnesota State Fair has also been occupying some of our time. If you make it to the Great Minnesota Get Together, stop by the many agriculture exhibits including our Minnesota Farm Bureau exhibit behind the giant yellow slide on Underwood Street or stop by the CHS Miracle of Birth Center and take a ride in our Ag Cab Lab – Tractor. Learn more about our exhibits and other great farm exhibits on Lara’s blog. Some of our broom corn was either blown down or because of the hard quick rain was washed down by the heavy flow of water. The storms also affected some of our strawberry popcorn. It is yet to be determined how badly it was damaged. 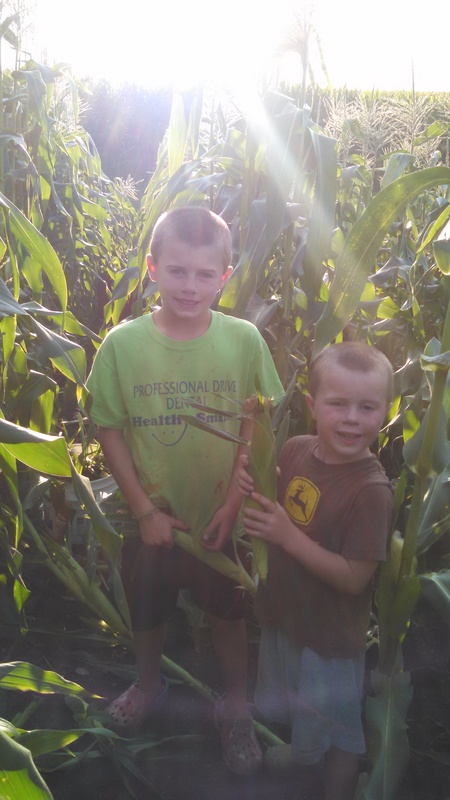 The boys are still learning how to pick sweet corn so we apologize if some of the ears are a little smaller. By the end of the season, we should have some professional harvesters. 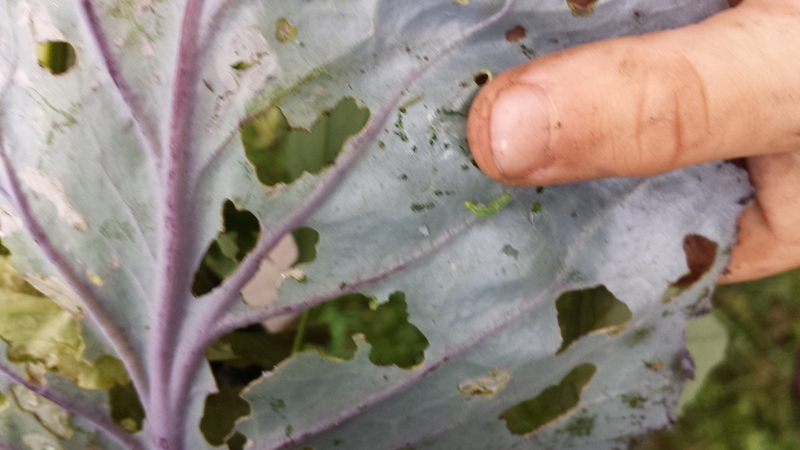 Black Seeded Simpson Lettuce – Wash your vegetables before eating – a new crop should hopefully be growing after this rain. I planted over 4 weeks ago but due to the lack of rain did not grow. I did irrigate it but it’s not quite the same as Mother Nature. Prizeleaf Lettuce – A beautiful colored lettuce to add to the salads. Try adding some fresh berries or dried fruit to your salads. Red Oak Leaf Lettuce – Wonderful color to your salads. Kohlrabi – Check out this link for more information on what to do with this vegetable. We were harvesting tomatoes this week and had to make a dash for cover as a thunderstorm approached and lightning chased us out of the garden. Sam completely forgot about the lightning thought as he discovered a toad in our rock wall. The world seemed to come to a stand still as he searched for the toad. Tomatoes – Baby Boomer cherry tomatoes, Big mamma, Sunny Boy (yellow), Honey Delight (small yellow) and Fourth of July (medium red) – A delicious salsa recipe from a farm wife in southwestern Minnesota, Ruth Lanoue. 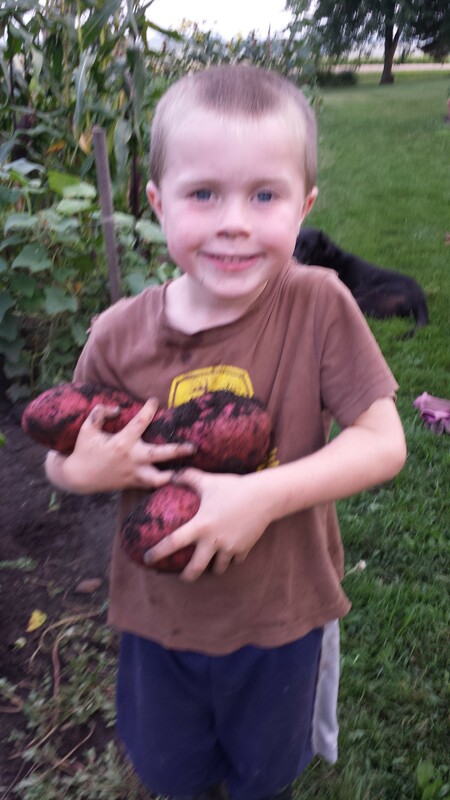 Keith snapped this picture of Sam with a huge Kennebec potato. Potatoes – Kennebec potatoes – great for baking. Here is a yummy potato recipe to try from one of my friends Lara Durben. 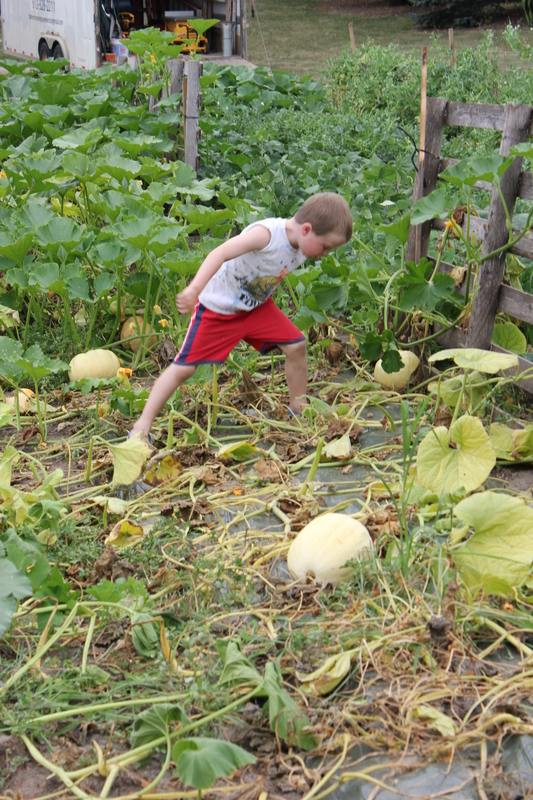 Well, the Big Moon pumpkins have grown. The largest one is now measuring from one side to the other at 3 feet. Growing several inches this past week. The other two also grew. What is interesting is the other two seem to be on the same plant and are growing at the same and equal rate. Did you know that we gather the rain water from our shop roof into this water tank to irrigate the mulched areas in our garden? We use gravity to flow the water into the irrigation lines. The rains filled the tank up! Place on grill at the same time you are cooking your meat. I leave mine on for about 1/2 hour and throughout that time frame turn it so all sides are cooked. Once the 1/2 hour is done, husk it, rinse under luke warm water and serve. Enjoy! Husk your grilled sweet corn by cutting off the end with a butcher knife. Grab the top of the corn and squeeze. Your ear of corn should slide out clean of silk etc. We are excited to see the cantaloupe and watermelon growing. The CSA brings science to life every day for us in a very hands on way. We walk our garden daily scouting for any issues that may need to be addressed: weeds, insects, fungus etc. We have been dry and were very thankful for the 2/10″ of rain we received on Monday. 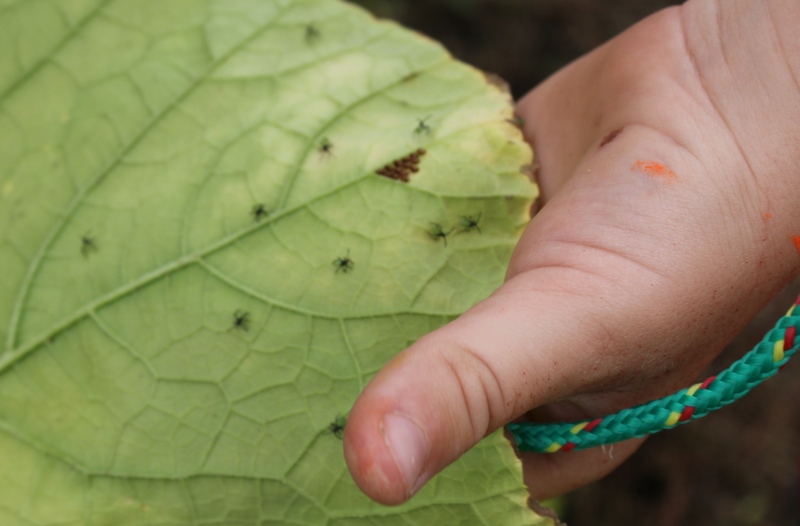 Below you will see that we have seen an increased activity of squash bugs and the potato bugs. They are busy reproducing again. We continue to spend a lot of time taking care of the over population of these nemesis insects, researching management and control options and looking for ways to generate beneficial insects to help manage them. While these are challenging issues they are great learning opportunities for all of us. In addition, we have some interesting things growing on the trellis’ check out this Butternut squash, defying gravity and growing up instead of down. Every day there is something new to observe, something new to learn and understand. The definition of science is: the intellectual and practical activity encompassing the systematic study of the structure and behavior of the physical and natural world through observation and experiment. This is a good definition of agriculture every day which provides hands on opportunities for all of us to learn from. We found this Butternut Squash is defying gravity and growing on the trellis’ upside down. We inspected the vines to see what was causing the to die. We cut open the stems to see if there were any insects in the stem. We found the brown eggs and spider-like small insects. We took the leaves in and placed the leaf and eggs under the microscope. 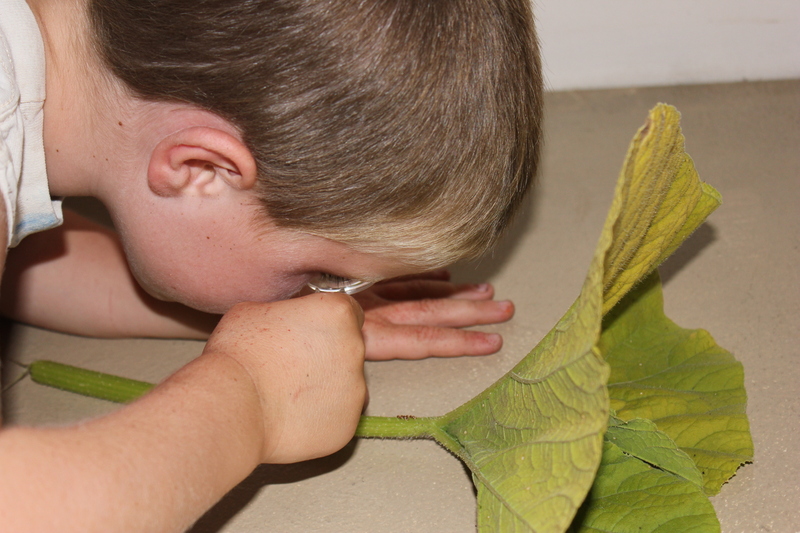 We also used the magnifying glass to get a closer look at the Squash Bug eggs and newly hatched Squash Bugs. 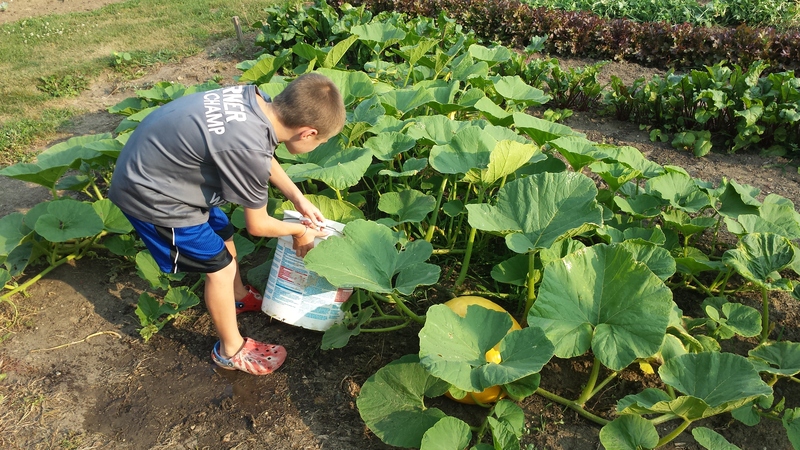 This is how Sam feels about the Squash Bugs attacking the pumpkin plants. 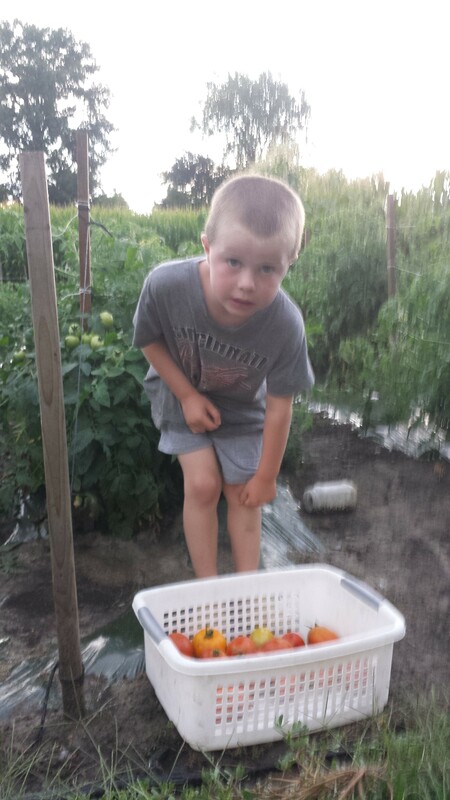 Sam inspecting the potatoes for potato bugs. 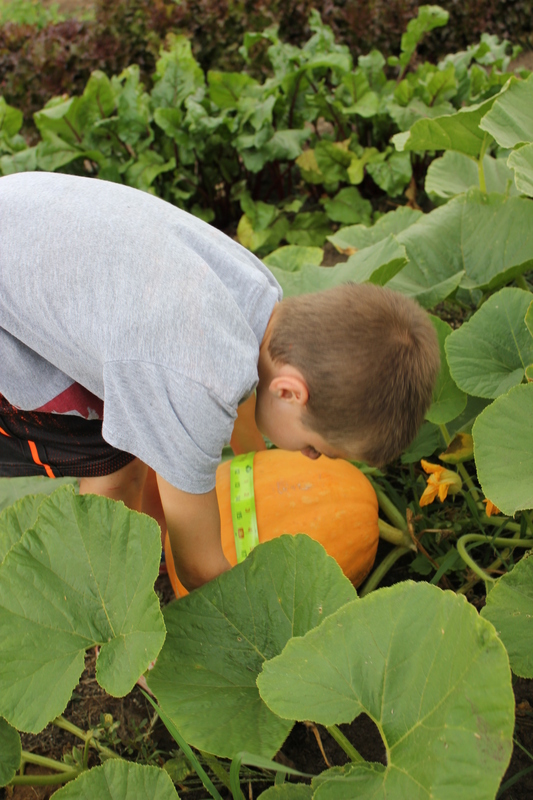 We measured the Big Moon pumpkins and discovered they had grown between 2-3 inches this past week. Black Seeded Simpson Lettuce – Wash your vegetables before eating – I love to use my salad spinner after washing the lettuces. Beets – One of my very favorite vegetables. The whole plant is edible. Green Beans – Try freezing or canning some of your extras or simply eat them raw. A few more green bean recipes for you. Cucumbers – If you would like to can any pickles let us know. We also have dill for you to use as part of your share. Tomatoes – Baby Boomer cherry tomatoes, Big mamma, Sunny Boy (yellow), Honey Delight (small yellow) and Fourth of July (medium red) – If you are like me, I am super excited for some BLTs. Enjoy, a lot more to come! Learn more how tomatoes are grown. 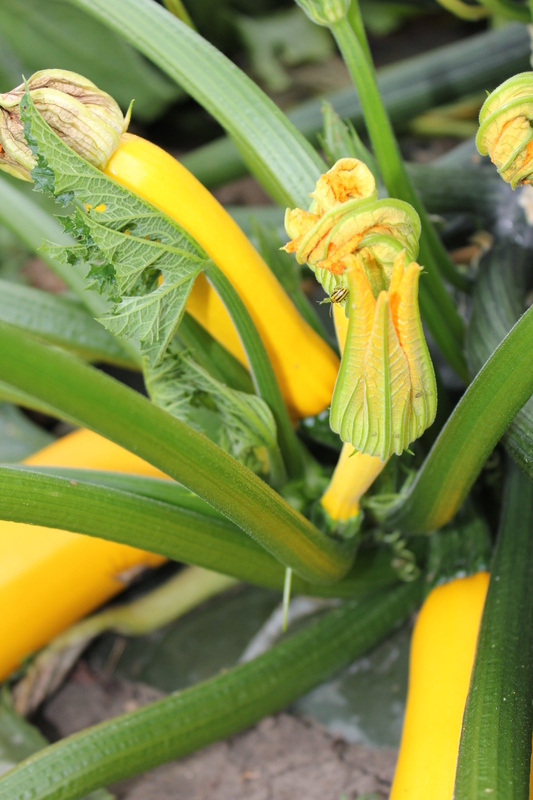 Summer Squash/Zucchini – Some ideas from America’s Heartland on how to use this vegetable. Potatoes – Red Pontiacs – Learn a little potato history. 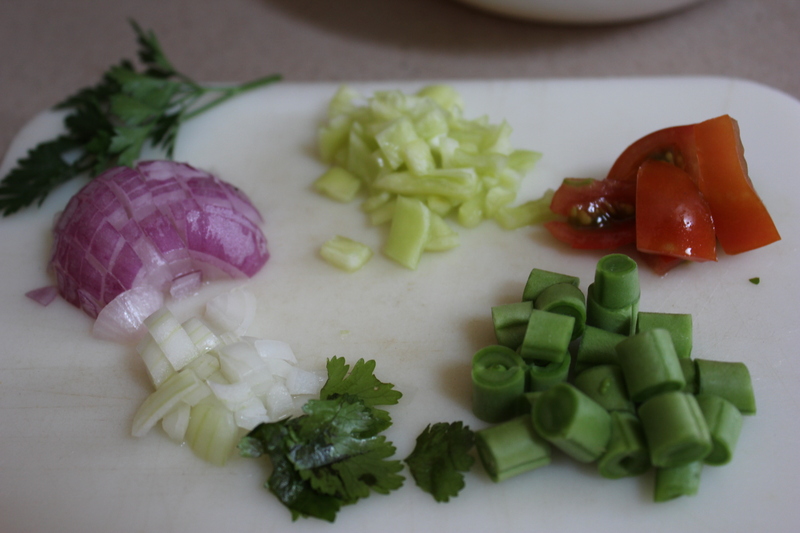 Cilantro – Here is a fresh salsa recipe for you to try. In a shallow bowl, whisk the first five ingredients. 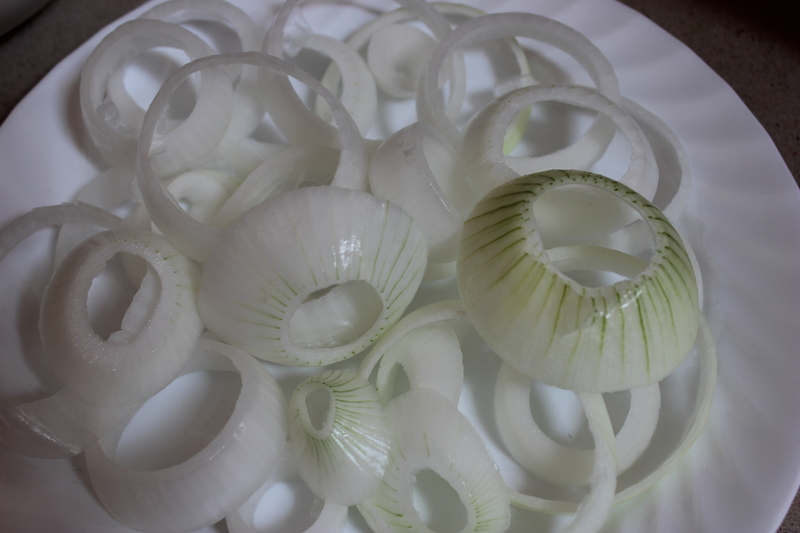 Separate onion slices into rings. Dip rings into batter. In a deep-fat fryer, heat 1 in. of oil to 375°. 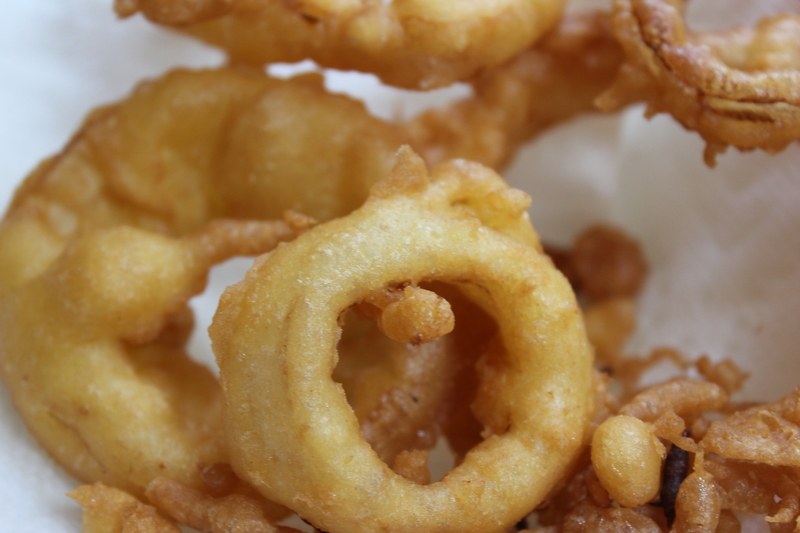 Fry onion rings in batches for 1 to 1-1/2 minutes on each side or until golden brown. Drain on paper towels. Serve immediately. First to make the onion rings: wash and peel off outside skin of onion, slice the onion and separate the rings. Mix together: 1/2 cup all-purpose flour, 1/2 cup water, 1 egg,, lightly beaten, 1 teaspoon seasoned salt, and 1/2 teaspoon baking powder. Place rings into batter. 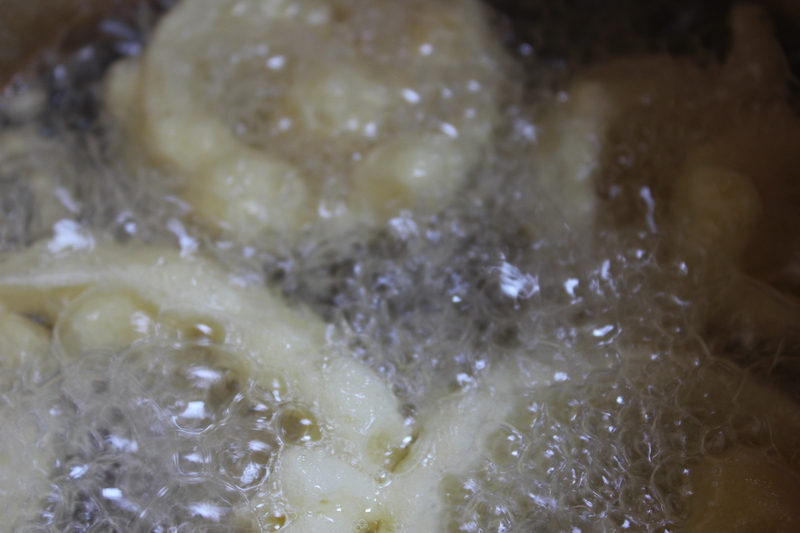 Place a few into the deep fat fryer at a time, flipping once to cook on both sides. 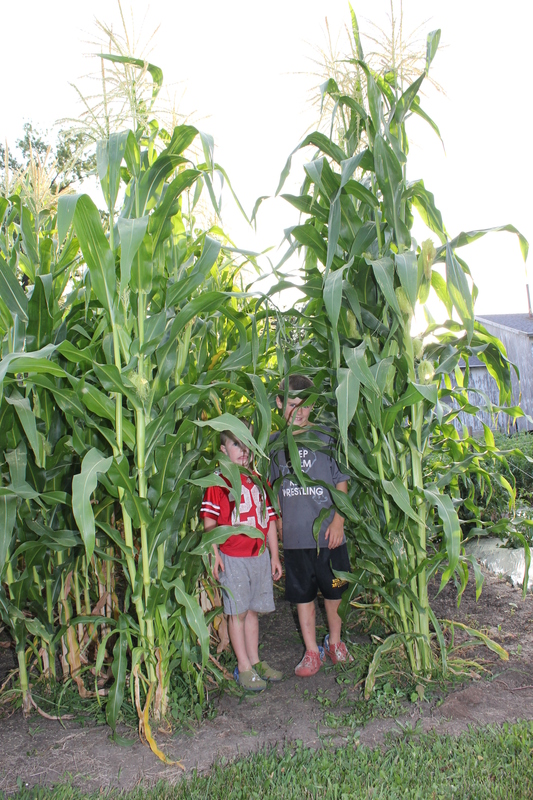 The corn has gotten so tall. The boys are standing by the blue popcorn. After our CSA pick-up, we enjoy sharing about our evening and the conversations we had with all of you. We learn a lot from the time spent with each of you and appreciate the conversations and time more than you will ever know. 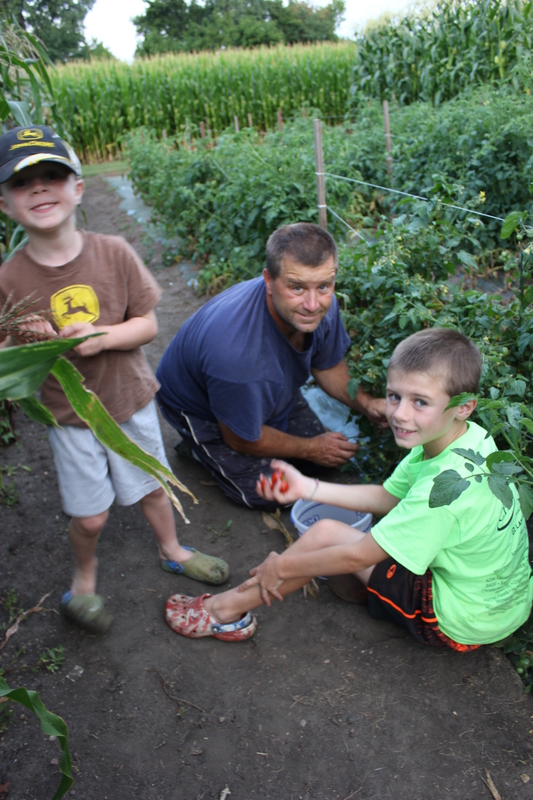 In fact, during each season we ask the boys what they enjoy most about the CSA. 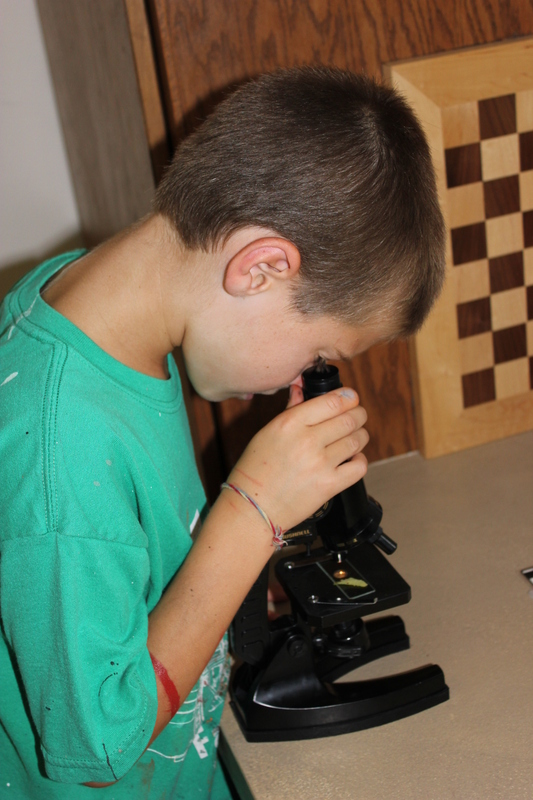 Their number one response is when you and your kids come out, and they have the opportunity to show you what is “growing on” and to teach and show what they have been seeing and learning that week. I know at times some of you may wonder if it is an intrusion of our time – I am telling you that it is not an imposition but rather a great opportunity for all of us to learn together. Last week seeing a few of the boys pull and eat carrots with our kids and to see their mouths covered with dirt. 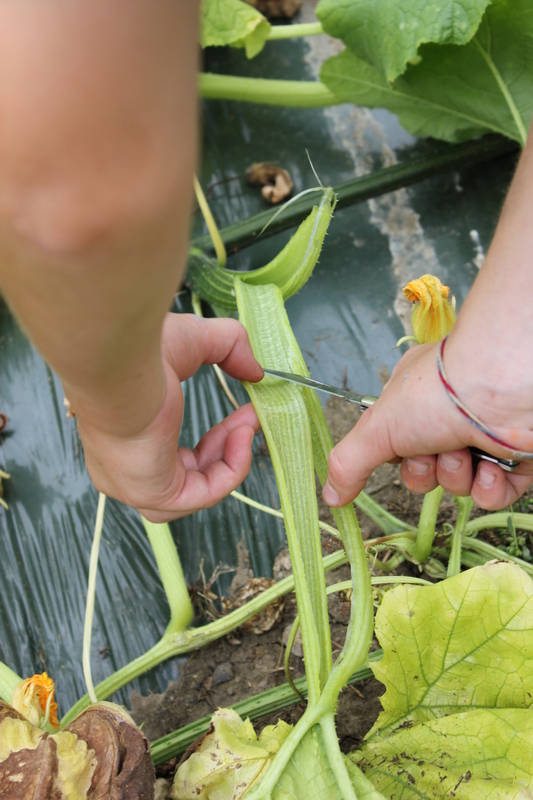 One of our youngest shareholders, wandering through the garden and teaching her the vegetable, the color, the different way they all felt and teaching her how to harvest them…and then to watch her eat all of them like they were an apple – including a pepper! Then the look on the boys’ faces when I told her how this nearly 2 1/2-year-old had enjoyed eating everything including the pepper – simply priceless. 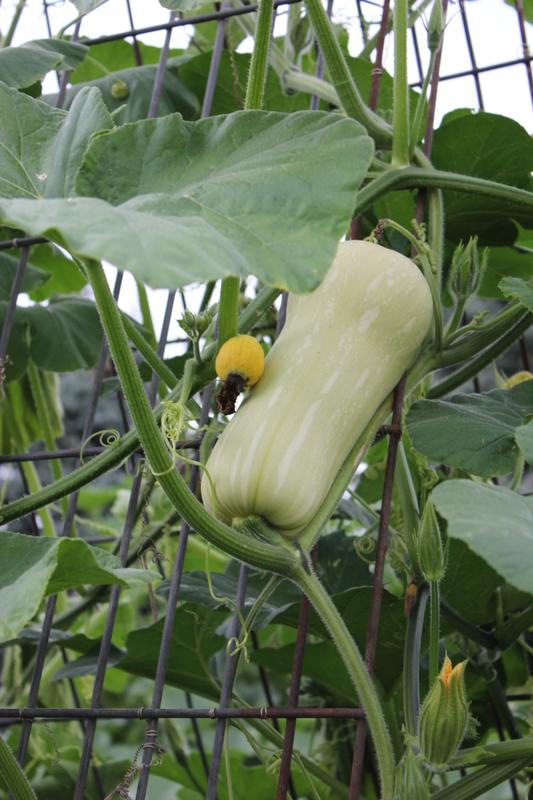 The joy of assisting a shareholder to harvest additional zucchini – one of her favorites. The excitement on some of the kids faces when they dig potatoes or pick a vegetable for the first time. Or learning from all of you the favorite ways you enjoy the produce. These priceless moments provide us with renewed energy and excitement. 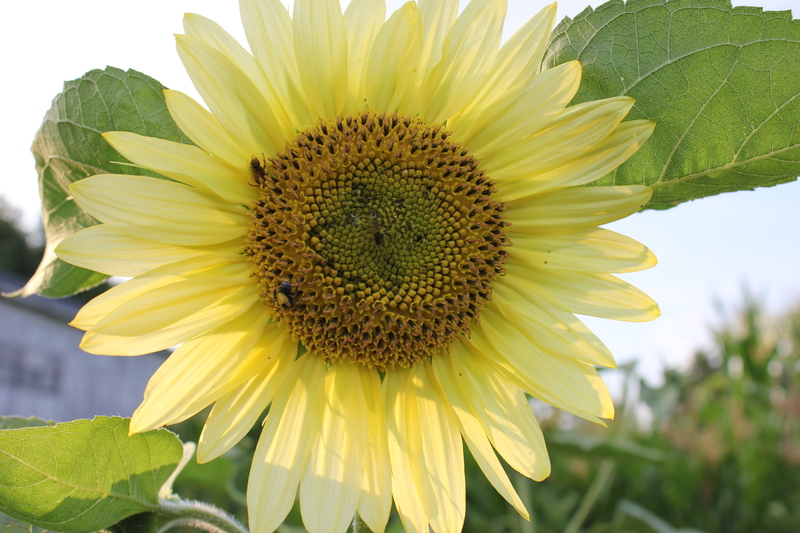 Sometimes the growing season can be challenging whether it is weather challenges, insects or weeds. But remembering some of these priceless moments brings smiles to our faces and renews our enthusiasm for the project at hand. Thank you! 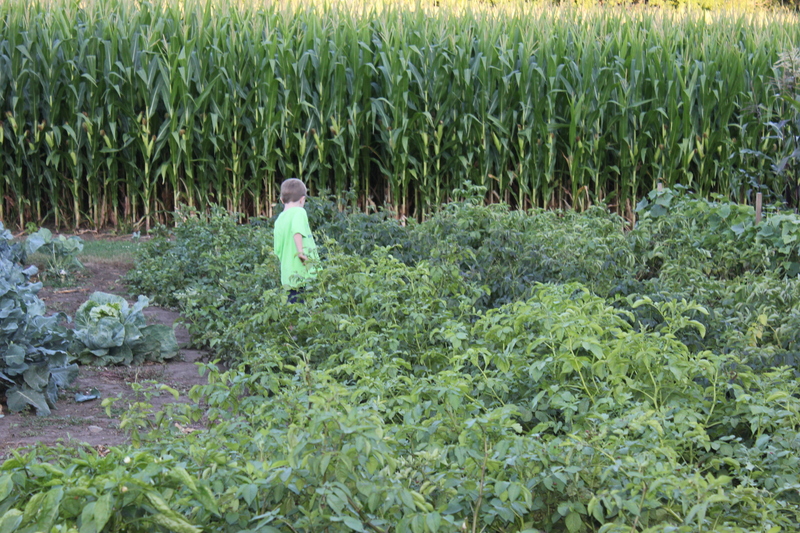 It has been dry, and we have been irrigating and watering the different crops. 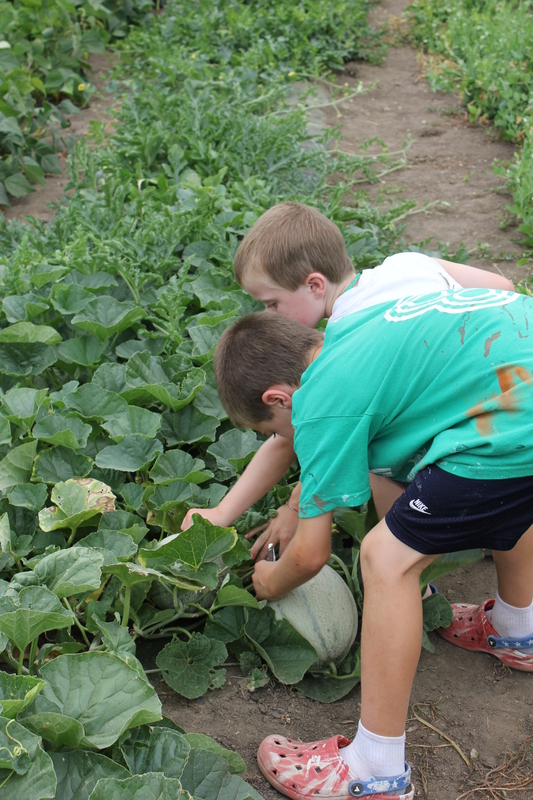 The boys have been watering our Big Moon pumpkins, and we also measured them this week. We are watching how much they grow in one week. Stay tuned. The broom corn is also growing tall. Notice that the different varieties of corn have differences in their stalks, tassels etc. Spinach – Remember to wash before eating. Sugar Snap Peas – This crop matured quickly this week with the heat. Some of them may be quite large – you may want to peel the pod off and just eat the peas inside on the larger ones. Green Beans – Try freezing or canning some of your extras or simply eat them raw. Learn more about this crop and a few recipes at America’s Heartland. Let us know if you would like any to can or to pickle. We donated 20# of green beans this week to the food shelf. We were curious as to how much the cucumbers would weight. 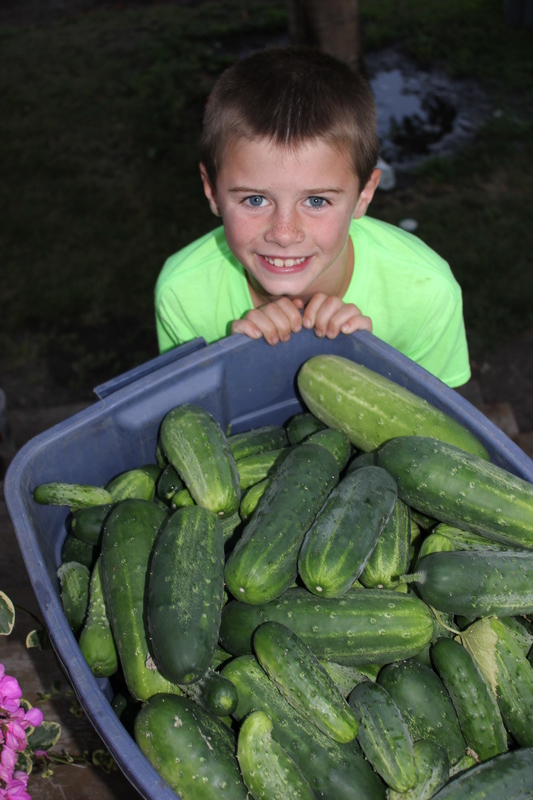 All of the cucumbers weighed 95 pounds. Picking the first tomatoes of the season. Tomatoes – A taste of tomatoes this week cherry and Fourth of July tomatoes. Looking forward to this crop maturing. Summer Squash/Zucchini – Here is a recipe for you to try. Onions – Yellow, white and purple onions. Kohlrabi – In addition to eating the bulb – similar to a cabbage. The leaves are similar to kale. Here is more information from Martha Stewart. Cilantro – Here are a few ways to use this herb. Fresh Arrangement – Hosta leaves and a Rudbeckia, Zinnia or Sunflowers. 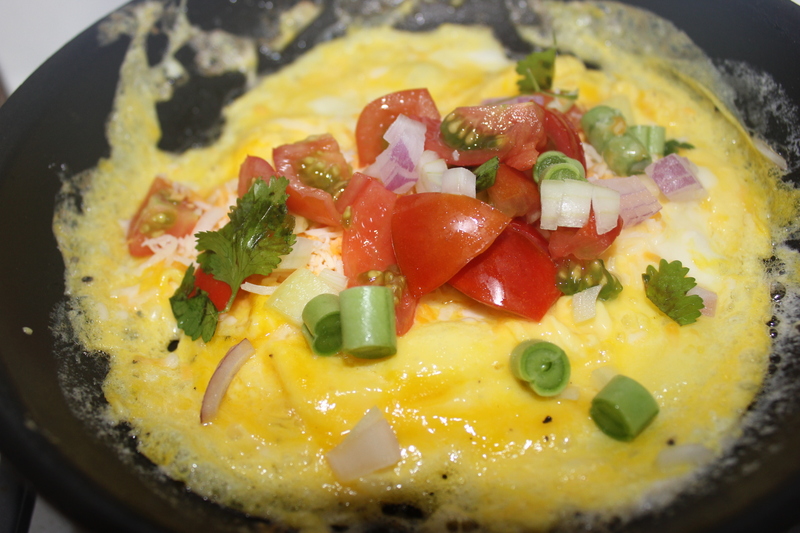 I chose a variety of vegetables and herbs from the garden to use in the omelet: green beans, cilantro, yellow and purple onions and tomatoes. You could also use squash and additional herbs. Next, I washed and chopped all of the vegetables. Before any cooking begins for this meal, everything is mixed, prepared and the table set because it all moves very quickly. 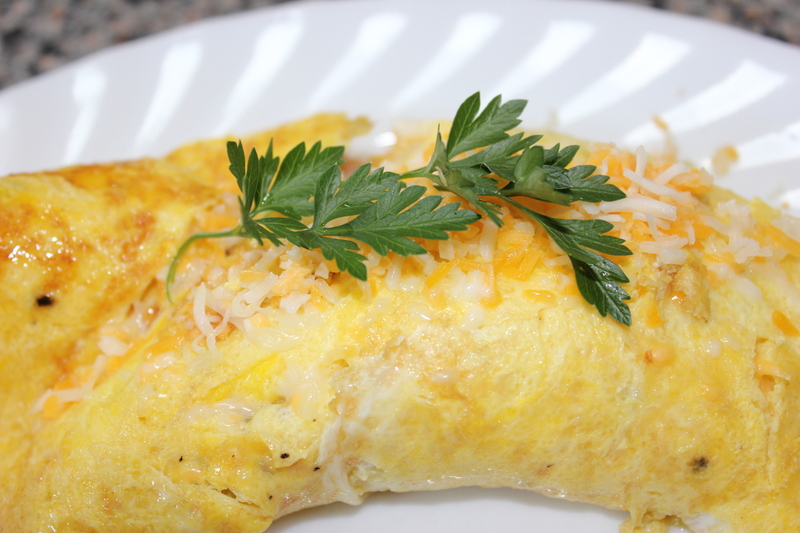 One omelet: mix 3 eggs, 1 Tablespoon milk, 1/4 teaspoon salt, dash of pepper, and herbs of your choice that have been washed and torn into smaller pieces. Place about a Tablespoon of butter in your pan. Melt the butter and coat the inside of your fry pan with the butter. Next place your egg mixture into the fry pan at medium low heat. Gently push the sides of the egg mixture up as it cooks allowing the uncooked egg to run into the area you just pushed towards the middle of the pan. Continue to do this all the way around. 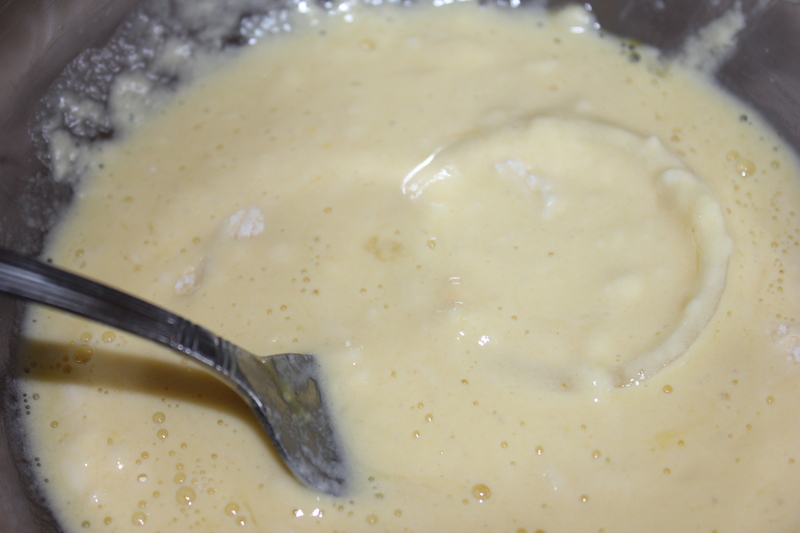 Once most of it is cooked, place your ingredients onto the egg mixture and place cover over it. Turn to low. 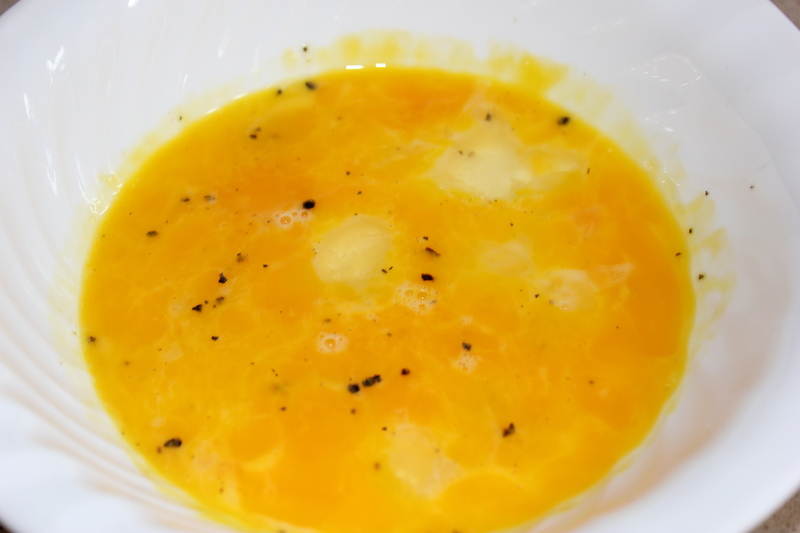 Cook until egg is firm and cheese is melted – about one minute. Then gently roll omelet out of pan onto your plate. Garnish with your parsley from your herb pots and a little cheese. I learned in 4-H foods project that a garnished dish will always taste better to the person consuming it, simply because of the way it is presented. Heat skillet. Butter pan with butter. Place egg mixture in skillet and cook slowly. Run spatula around edge, lifting to allow uncooked portion to flow underneath. Place choice of filling inside. I included vegetables, a couple of our favorite cheeses (mozzarella and sharp cheddar). Turn off heat or place on low. Place pan cover over the mixture for about a minute allowing cheese to melt. Fold sides over as you flip it onto a plate. Garnish with parsley and cheese.